Electromagnetic Induction - Hager-Richter Geoscience, Inc. : Hager-Richter Geoscience, Inc.
Electromagnetic induction (EM) methods allow for the rapid acquisition and interpretation of large quantities of data, making it cost effective for many projects. EM can be used to detect and locate both metal objects and zones of conductive contamination. 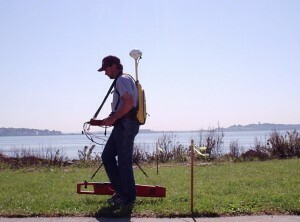 It is the only widely available geophysical technique that is sensitive to the presence of both ferrous and non-ferrous metal objects. 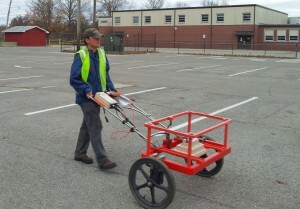 EM complements both magnetics and ground penetrating radar (GPR). Frequency domain EM instruments measure the apparent conductivity of the subsurface, including effects of the soil, bedrock fractures, contaminants, metal objects, and ground water. Variations in apparent conductivity may indicate changes in composition, layer thickness, or moisture content. 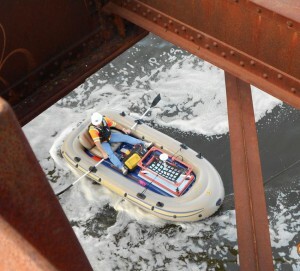 The presence of buried metal such as drums, USTs,and/or utilities strongly affect EM response. Some time domain EM instruments are specifically designed to be sensitive only to the presence of metal objects and are used as precision metal detectors. Data are acquired at single stations and/or continuously along lines. Our digital field data recording capability allows us to collect and interpret data both rapidly and accurately. We use a variety of EM instruments and data collection methodologies, including standard profiling, multiple coil spacing, conductivity sounding, and downhole tools designed for used in open holes or in PVC cased borings. Such flexibility allows us to design a program to meet your needs. 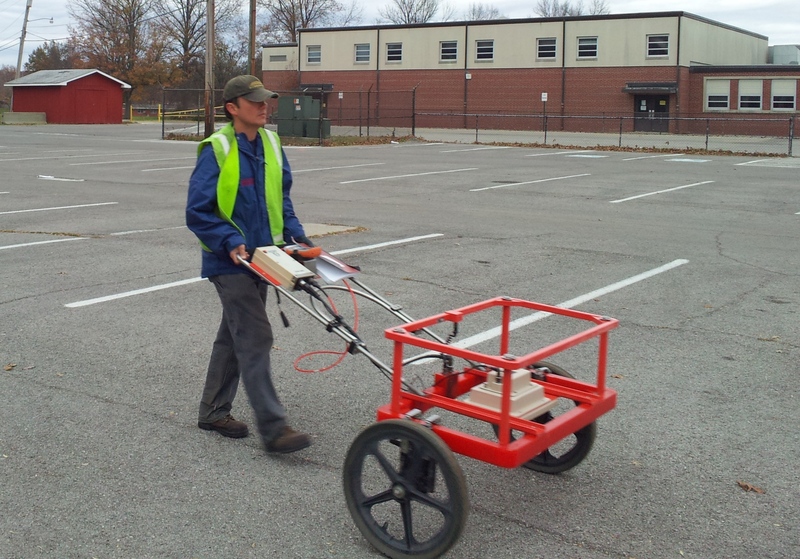 Electromagnetic induction surveys have certain limitations. They may be unsuitable for examining highly industrialized and/or urbanized areas where cultural features such as buildings, pipelines and power lines may interfere with the collection of accurate data. 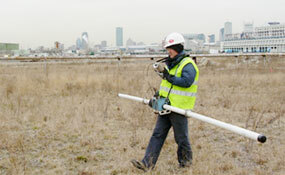 Electromagnetic induction is also unsuitable for locating small isolated objects on a large site. A military site in the Northeastern U.S. contained exploded and unexploded buried ordnance. The client had proposed installing monitoring wells at several locations as part of a hydrogeological study of the site. Our task was to examine each proposed boring location to determine whether buried metal objects, some of which might be ordnance, were present in the vicinity of the proposed borings. 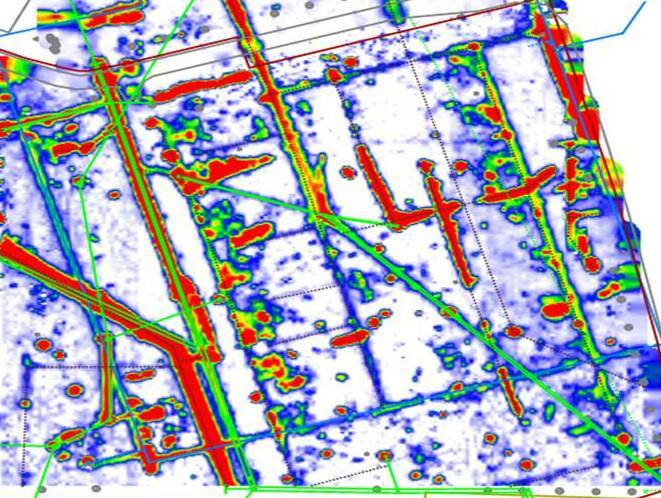 Since much of the ordnance consisted of brass, we conducted both a focused terrain conductivity survey and a magnetic survey centered on each proposed boring location. After analyzing the data, we recommended that several of the proposed borings be relocated, and the wells were subsequently installed without encountering any subsurface obstacles.